Our third son, Wylder Reisen Swartz, was born on September 17, 2012. A few weeks prior we moved into a treehouse in Montreat, North Carolina. Six months spent in a wooded small town nestled in the Smoky Mountains, it’s been an experience we’ll never forget. But six months is a long time to be in one place, and we’re all itchy for the road. We knew that when Wylder was born we would need to revisit our traveling life to see how it would be able to remain possible, given that our old Volkswagen Bus was just not going to be nearly large enough. We’re just not young parents with an 8 year old anymore, we’re a huge family that requires a lot of well oiled parts to keep our days running smoothly. 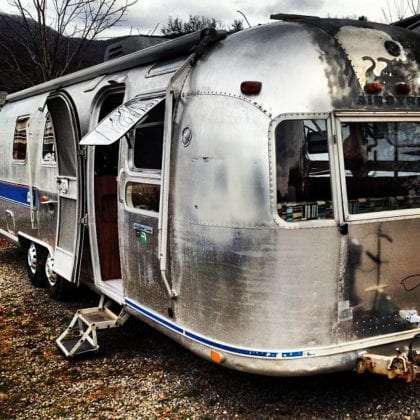 To that effort, in January we purchased a 1976 Airstream Sovereign of the Road. We’ve been renovating it over the past two months and, as of yesterday, feel like we’re finished. On Monday we’ll hit the road again, exploring some more of the Southeast coast that we feel we just haven’t soaked up enough before heading north and back out West over the summer. We’ll continue to keep putting out the same types of monthly issues that we’ve done since the magazine’s inception in April of last year. We plan to cover some amazing spots this year, such as the aforementioned Southeast coast, the Badlands of South Dakota, the big National Parks in Montana and Wyoming, and then onto the Pacific Northwest and Canada before we start looking at where we’ll head for the end of the Fall season and into Winter. We’ll also be doing extensive articles on how to purchase an RV, alternative ways of full-time traveling (ie, all of you who dream of doing this but don’t necessarily want to live in a moving vehicle), and continue to revisit our ongoing series on raising children on the road. However, this blog will be changing over the next few months. The blog here has always been a sort of aside anyway, just a place to put things we didn’t think were necessarily “issue” material, just little notes here and there and additional information about larger articles. We’ll still do that, but we’re going to start doing some other things with the blog as well, such as posting home movies, doing more personal journal type entries, and integrating some of our other social media efforts so that the blog can serve as a sort of singular social experience for all things Wand’rly. I believe we’ll even be adding comments, something I think people have been interested in for long enough that we’re finally going to commit to that as well. As we begin putting together issue #009 we’re very much excited about the possibilities of the future while at the same time astounded by the following this little web magazine has garnered in less than a year. We’ve found several excellent writers and photographers, not to mention bands and interviewees, over the past year, celebrated a massively successful Kickstarter campaign, and have moved into a completely new chapter of our lives. Thank you to everyone who made this all possible and we’re so looking forward to another great year of full-timing with you all.